Not only observe general waveform but also can find every waveform detail. The default memory depth is 18Mpts,and it can be upgraded to 90/360Mpts. Swipe out measurement menu,tap to select or cancel the meaurement icon, it makes operation more convenient. Flick left or right lightly to locate your wanted waveform, it gets your waveform clearer quickly. You can set 4 sets reference waveform to compare,which makes you work easier. 5 Math operator:+,-,*,/,FFT.FFTcan add Rectangle,Hamming,Hanning, Blackman-Harris window function. Tap cursor icon to open or close cursor function,tap to select or cancel vertical or horizontal cursor line,then flick longer cursor line screen left or right to fix your wanted waveform position easily. 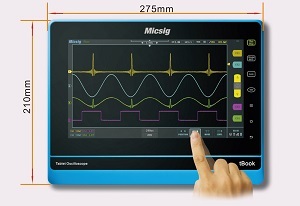 Abundant operation,exept for multi-touch,user can operate the oscilloscope by mouse connected with USB port. Mouse operation brings you one more option when measuring. Tap the right corner lock to open or close finger operation,it makes your work more safe. tBook series waveform capture rate can be upgraded to 250,000wfms/s or 500,000wfms/s.Improve the probability of catching the abnormal signal to 90%.The higher capture rate, the shorter dead time of waveform,abnormal signals can be caught fast and accurately,which gives you the highest probability of capturing random and infrequent events.